Trivia games are always a challenge for two reasons. First, someone with the right knowledge base will probably dominate, while someone without the right knowledge will just sit there feeling useless. Also, the limited mechanic of asking a question and replying with an answer can get stale fast. Various game authors have addressed this in various ways – the most famous being Trivial Pursuit. Now credit given, where its’s due – this was a break-out game and has become a pop culture icon, but the roll and move mechanic and the uninspired board spaces does not make for a good game. 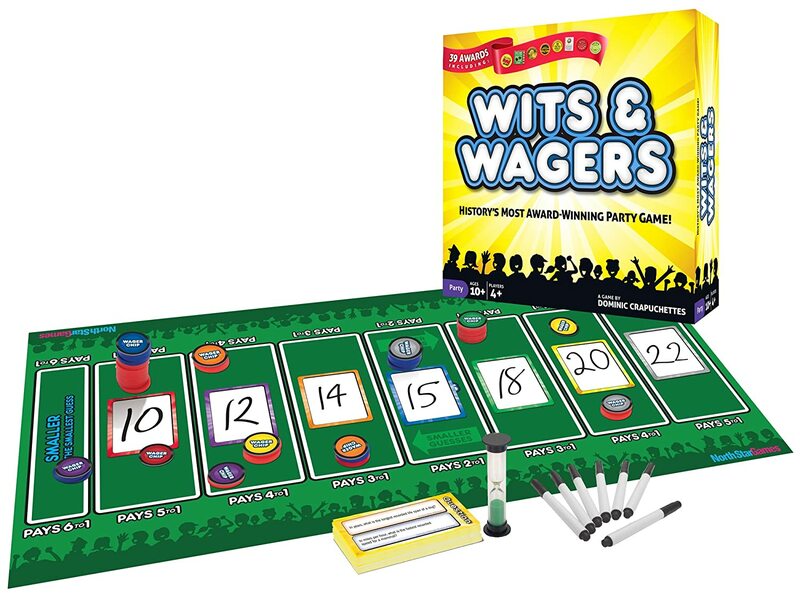 An excellent approach was found by the authors of Wits & Wagers. The game equally rewards knowing your trivia as well as knowing your play group. Over the course of a number of rounds (typically seven), participants will have a question read to them – the question will always have a numerical answer. In secret, each player/team write down their answer on a color-coded dry-erase board, then reveal simultaneously. The answers are then sorted increasingly and laid out on the board. Next, all the teams bet on the answer(s) they think are correct. You always have two chips of your color (so you can make up to two bets) and you can bet any chips gained in previous rounds. Once bets are placed, the correct answer is revealed and the guess closest without going over wins. The player/team who made that guess gets a small bonus and anyone who bet on that guess also gets a payout. The payout depends on how far the correct answer was from the median. And so it continues for the prescribed number of rounds. The winner is the player/team with the most chips. This has quickly become one of our favorite filler games – a perfect ending to an evening of gaming. Lots of laughs can be had, when someone really misunderstands a question. Who cares that I’m bad at betting? But the game really shines as a convention game. You can then have teams and spectators. The person running the show can really ham it up and use an assistant to track the money. Really make a show of it. To wit, we’re making a jumbo version of the board for that purpose. You may have noticed, that I didn’t specifically mention Magic in this context. That’s because, so far, I haven’t had a chance to run a Magic specific game show. But that day will probably come. If you’re a little confused about how the game plays out – here’s a quick example. Chandra, Jace, and Lilliana are playing a game of Magic Wits & Wagers. After three rounds, Jace has won 3 chips, Lilliana 7 chips, and Chandra has zero betting high in the previous round. Each player writes down their answer – trying to get as close as possible without going over. Chandra writes 999, Jace writes 600, and Lilliana writes 350. They all reveal their whiteboards, sort them ascending and lay them out on the board. The order is now 350 (payout @ 2:1), 600 (3:1), 999 (2:1). Now they have one minute to bet. In addition to the chips won earlier, each player has 2 chips in their color that are never lost – this also means that you place two bets (putting the other chips under your starting chips). Chandra is sure of herself and puts down both chips next to her guess. Jace hedges his bets and places two chips each (one owned, one generic) on his and Lilliana’s guesses. Lilliana does likewise, but puts down three on her guess and one on Jace’s. Now the players check the answer – 629. The correct guess is Jace’s. All other chips are discarded (starting chips go back to the players). Jace gets 3 chips for getting the correct answer and then Jace gets his two chips back + 4 chips (2:1 payout) and Lilliana gets her chip + 2 more. If Chandra’s guess would have been correct, she would’ve got her two chips back + 6 chips (3:1 payout) and 3 chips for being correct.